“Hue” Review + Steam Key Giveaway! UPDATE: The contest is over and the winner was announced. Check out the follow-up article here. Ya know, it dawned on me that I never ended up writing an article about this, but my sister was kind enough to sign me up for a 6-month subscription to TheIndieBox for Christmas! So far I’ve received the boxes for December and January, and have been both surprised and very impressed by the content and quality of each. The January box was for a game called Hue. I’d never heard of it before, but a quick Googling yielded some lovely images and details about a mysterious puzzle-platformer. Oh man. Puzzle platformers are my jam. I’m currently in the midst of a Final Fantasy X playthrough and a chill puzzle-platformer is exactly what I need to cut the tension! Last Thursday I finally received the package, a little delayed given the Chinese New Year presumably delaying production, cracked open the beautiful case, loaded up the DRM-free disc and installed it immediately. The box was also filled with some other awesome goodies, but I’d like to keep this article strictly about the game itself, so you can get a vague idea of what’s included by clicking here. 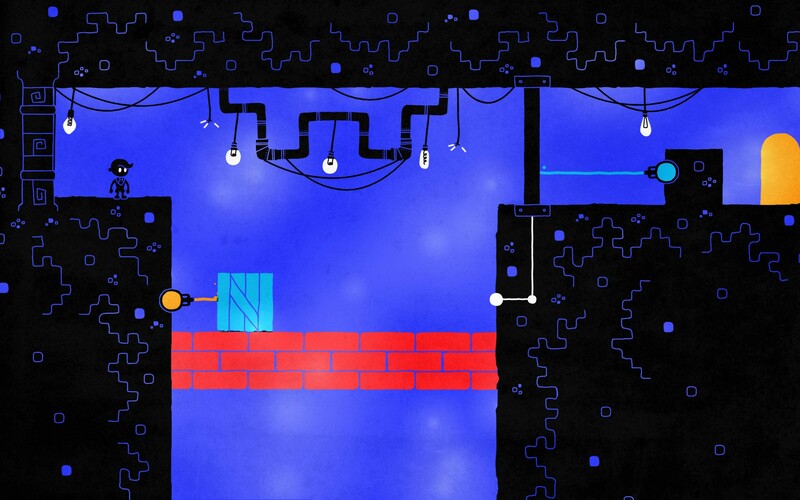 Hue is an adventure game, wherein you manipulate the environment by changing the background color of the levels. You control a boy named Hue as he navigates a world of gray, but with the power to control the colors using the “Annular Spectrum.” You are guided by letters from your mother, who has been trapped in another dimension after her scientific research on color went too far. This game has received many accolades and for good reason. The puzzles begin simple enough but quickly increase in complexity. 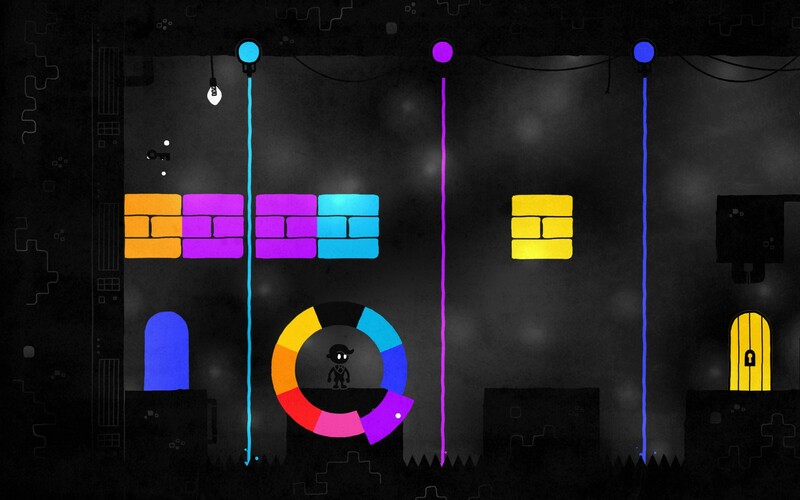 As Hue progresses through the levels, he unlocks more colors on the color wheel, allowing him to interact with blocks and shapes across the whole spectrum. 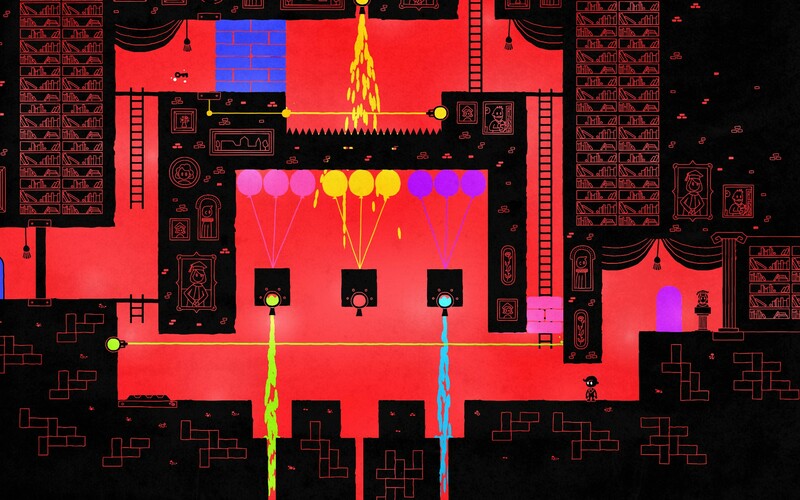 The complexity not only stems from having more blocks and more deadly traps that require trial and error – sometimes the situation is made more urgent (for example, by falling rocks or crumbling platforms) and the player is required to change colors quickly. While you are operating the right joystick to bring up the color wheel, time slows down (think bullet time) and gives you an extra second or so to select your color while Hue is still in movement. Eventually you learn to make these changes quickly and without fully opening up the color wheel. This kind of fast motion can only be performed with practice, and Hue is a fine example of the type of puzzler where you simply fail until you have mastered the level. Memorization of the color locations on the Annular Spectrum is paramount for success in Hue. Of course, this comes most in handy when playing the levels that require fast and precise inputs, but also makes the overall gameplay extremely satisfying when you can move about effortlessly, changing the color on the fly and acting almost on pure instinct. This is very rewarding and once I forced myself to focus on nailing the color change every time and thus built this muscle-memory, the gameplay felt even more fluid. Like I’ve noticed in the trend of indie games lately, there is full controller support, and this is how I recommend anyone picking up the game to play it. Overall, I highly recommend this little puzzler. It’s full of life and polish and the mood is set by the solemn yet appropriate-to-the-story soundtrack. Speaking of story, it keeps a backseat to the gameplay for the most part, and you are in control of Hue for probably 99% of the game. It doesn’t shove a story down your throat, and the gameplay alone is plenty reason to take a dive into Hue. It’s a short runtime – I’d put it at around 4 hours, maybe 5 if you go for all of the Beakers, which are the only collectable in the game. It’s $15 on Steam. Every one who wants to enter must be a registered WordPress user and Follower of NostalgiaTrigger (this is to deter randoms from finding the blog and spamming comments). To enter, leave a comment below telling me about your favorite indie game of 2016. I’m going to let the giveaway run for a few weeks (probably two), then dump all the applicant names into a random number generator and roll the dice. Whomever’s name shows up, gets the key. I’ll contact the winner through the comments and then they can email me privately and I’ll shoot them over the key. This will probably occur on Monday, February 27th, giving you just enough time to start and finish Hue before the Nintendo Switch comes out. Good luck to everyone entering, and thanks for reading! My indie of 2016 is definitely Salt and Sanctuary. It was inspired by Dark Souls and plays like the classic Castlevania games. Don’t enter me for a chance to win Hue :). My backlog is insane and I’ll probably never get around to playing it. Oh wow, Salt & Sanctuary is at the very top of upcoming games. I’m waiting on a LimitedRun physical release for the Vita which is apparently pretty set in stone. I cannot wait for that game! It looks perfect. I think I’ve heard of this one from a few places, it’s received some good praise too! Not a fan of puzzle platformers myself but it sure does look cool. I keep hearing about that one – it looks awesome from a brief glance on the Steam store page. Thanks for entering!